The Ventura County Board of Supervisors has already given full support of this project by a vote of the board and by filing for grants on behalf of Quantum Reef (now Stanley's Reef Foundation). The former Lt. Gov. Grey Davis, then acting head of California State Lands Commission, has expressed support and offered his staff support to "help shepherd through the maze of permitting." Stanley's Reef Foundation has secured over 600 signatures of support with only a handful of outreach efforts. The use of this technology has been given to SRF from Highwave Sports System. Support from non profit groups and organizations has been given to SRF by many and include: The Surfrider Foundation, Ventura Chapter, Channel Island Marine Resource Institute, United Anglers, Ventura Surf Club, Oxnard Waveriders, Santa Barbara Surf Club, Members of Beacon, Members of Surfers Environmental Alliance as well as staff from the University of California at Santa Barbara, Oxnard Junior College and Ventura Junior College. There is potential for participation in this venture with commercial private sponsors and other entities interested in promoting their product while taking interest in the care for ocean habitat, beach erosion and quality of life issues. There is good local support, agency support, county, city as well as community support. Some environmentalists do not want to try any technology used in the ocean, even if proven to be inert or benign. Although it is safe and replaces lost habitat. Fortunately, they are a minority and most everyone sees the positive aspects of this project. Negating good technology will only leave us with bad technology. This project has used consultants associated with UC Berkeley, UCSB, Scripps, Naval Engineering Lab, Oceaneering Technology, Stolt Comex Seaway and Ogden Environmental among others. Stanley's Reef Foundation will spearhead fundraising efforts seeking donations from the private sector. Grants are likely with the assurance of permitting & monitoring from the US Army Corps of Engineers section 227 project. Venture capital or angel financing is also possible with the potential for success of the project and strategic partners. Some contributions have been accepted in support of this reef project at this site by individuals and a non-profit group. Discussions with the California State Coastal Conservancy give hope of a joint venture resulting in funding for natural landscaping and maintenance of the beach area. Additionally, Mobil Oil is required to pay $100,000 to any approved entity that takes possession of the land area left after the Mobil Oil lease. Ventura County Coastline is highly armored and in need of more sand cells. That fact may help justify federal support or other state or federal grants. The cost of the reef will depend on the size needed which will be determined by the bathymetry, beach slope and seasonal sand patterns. Stanley's Reef Foundation is a public benefit non profit organization. It is owned by you...the public. The board of directors are volunteers to promote it's positive goals. Special Thanks to the Pro and Legend surfers lending their support to this project. 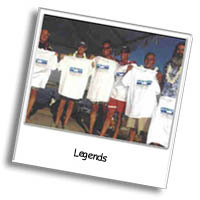 They include legends Tom Morey, Kemp Aaberg, Mickey Munoz, Paul Strauch, Rabbit Kekai, John Peck Robert "Wing Nut" Weaver. Pros Kelly Slater, Rob Machado, Tim Curran, Dan Chris and Keith Malloy, Shawn Hayes, Erin Edwards. A very special thanks to Betty Elder for all her hard work over the years putting on the best contests in Ventura! To order a t-shirt and sticker to help Stanley's Reef be built, please click here.